Whenever we ask a client about business directories they tend to give the same reaction. In their defense, the idea of putting your business on the Yellow Pages is a very traditional form of marketing. It started when these directories were distributed among homeowners who had telephones. The idea was, if you were looking for something then the Yellow Pages would be the best place to start looking. It proved to be a good way to market a business. Well, it was good in the 90’s. It’s 2015 and it has been well over 20 years since the heyday of business directories. The question is, is the idea still relevant? The answer is both yes and no. No because the directories of old aren’t reliable anymore. Rarely do we use the Yellow Pages to search for a plumber anymore. The only good thing is that local directories did not stagnate. As a matter of fact, they have adapted quite gracefully to the changes. In a nutshell, a directory serves as a portal wherein a customer can find the business they need. It’s like Tinder for business but with less surprises and no swiping left or right. Directories basically serve as a platform for businesses to be advertised to a large audience. Most directories are owned by people with bigger marketing budgets, they are perfect for small and medium-sized businesses that need that extra help with their marketing efforts. Most of the bigger directories do their best to keep a high authority online. Due to this, listing your business on such directories can give you a big SEO boost. This will save your business some time and effort on your marketing campaign. The only downside with using a directory is that you will be listed with the competition. But instead of seeing this as a problem. I envision it as a way for you to get ahead of your competitors. Some directories give you means to customize your listing. With a well-optimized listing, you can assure that your listing will attract more customers. So go ahead and create a compelling copy and maybe add offers with the listing for more conversions. Now that we know the benefits of local directories, should we go and list our business on each and every one of them? But why? If they are that good for my business then I should go and list my business on all of them. That’s the whole point of the article right? In modern day SEO, you always go for quality and not for quantity. It doesn’t matter if you have a thousand directory listings if you only have five good ones. It can even hurt your SEO if you overdo it. With that in mind, here is a list of the best directories you SHOULD list your business on. I have included ten of the most relevant and therefore worthy of the time and effort you spend on listing your site. They will be divided into two lists. One list would be for local business directories while the other one will be for top sources for local citation sites. One problem most business owners face with local business directories is the consistency of information. What happens is that although a business is listed, the information within the listing are incomplete or wrong. Services such as Moz Local allows you, for a nominal fee, manage your directory listings. this is to ensure that all your listings are complete, correct, consistent, and visible across the Internet. Citation building is important if you want your data to be confirmed in Google and other popular search engines. We will mention the top 10 key sites you should focus on. Note that although it is nice to go and focus on your service area and category whenever you are building your citation, it will be good to include at least the top 10 while citation building. One thing to note about citation building is that although we just mentioned the top 10 sources for local directory citations, this is not the “one list to rule them all”. As a matter of fact, Moz.com compiled a much specific list of sources of local directory citations by category. This may seem like something created by the people behind Moz to cure their boredom but it is actually a comprehensive report on where you should list citations depending on your business. Think about it, apartment rentals would benefit more on a citation listing on apartments.com than lawyers.com. Oh and before you say anything. I know you might be a bit surprised why Facebook and Youtube is included in the list when they are not considered business directories. While that may be true, those two are considered Internet giants that contain a lot of content regarding local businesses. Let’s admit it. Not everybody has the time and Internet know-how to identify and register the best directories or source of citation listings. Honestly, it’s a task that takes time and some patience. The biggest issue for some is that if they do the directory and citation listings, they might submit inconsistent information or they end up signing up with the wrong ones. 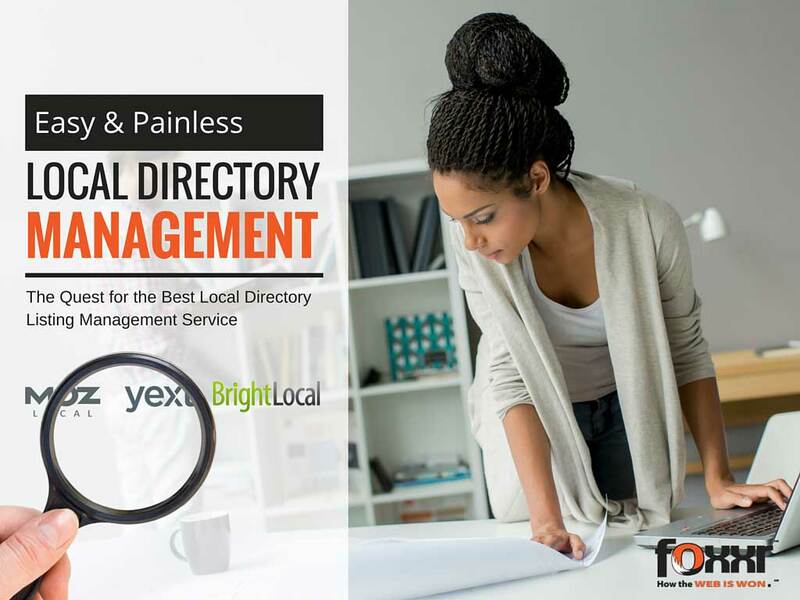 If you are having a hard time taking care of your directory listings, you can always use services provided by brands such as WhiteSpark, BrightLocal, or Moz. The idea is pretty simple. They provide you a central hub where you can check and manage your listings and citations. This way, you can easily update your listings whenever you need to. Not only that, they can also provide you a list of the best directories for you to use or the best sources of directory listings for your business. Follow us to learn more about best practices to get more out of your listings.